March 15th. to 19th. Another wonderful Menorca Britannia trip MADRID, TOLEDO, EL ESCORIAL & VALLE DE LOS CAIDOS Capital views, fabulous museums, swords, silversmiths, Christianity and Judaism, palaces monasteries, typical Castellan food and tapas galore. Our specially requested itinerary had been expertly put together by Gundi at Viajes Sant Lluis and worked like a dream with something for everyone over the five days. Saw us checking in at the airport at 6.00 am. Yes, 6.00 am!! for the direct flight to Barajas with Air Nostrum at 7.00 am. We had the luxury of pre booked seats we were all seated as a group at the front of the aircraft, (the same for the return flight). The flight was spot on time and by 8.30 we were boarding our special transfer coach to take us to our hotel, arriving just after 9.00 am. Our group was complete when 4 members (2 couples) joined us later in the day having flown in directly from the UK. The 3 star hotel Best Western Los Condes could not be better situated for exploring Madrid. Situated just 50 metres from the Gran Via, right in the heart of the city it is small, clean and comfortable with helpful staff. We were staying on a bed and breakfast basis. At this early hour we did not expect our rooms to be ready but they did have one made up where we could leave our luggage and freshen up for the day ahead. With the whole day and evening free to get out and start visiting the sites everyone rapidly dispersed in different directions. Obviously everyone had done a lot of previous research and each had their own list of places to visit. Whether it was the Prado or Reina Sofia museums, the Royal Palace, El Retiro Park or a visit to the well known up market shops on the Gran Via and surrounding streets (to name just a few). It became obvious that everyone was ready for a short siesta late afternoon when they could check into their own rooms, before heading out for tapas or an evening meal which proved not a little difficult as we were spoiled for choice as there is a great and varied number close by. The Puerta del Sol, Plaza Mayor, Puerta Alcalá and many theatres were also all within walking distance. After a substantial continental breakfast our coach turned up as arranged at 8.30 am and Bryce escorted us on the 50 minute journey to Toledo in the region of Castilla-La Mancha. The city sits high above a gorge cut by the River Tajo on a u-bend , the cliffs its natural defence. Here we were met by Carmen Gómez our guide in Toledo for the day. We could not have had a better guide than his young lady with a Phd in Hebrew and religious philology at the Complutense University of Madrid. 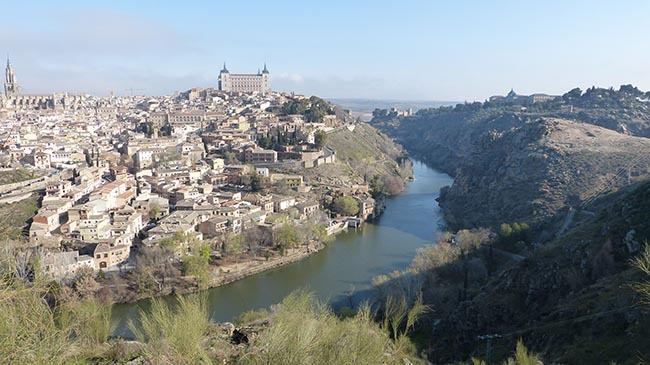 Very warm and welcoming, Carmen was a mine of information about the history of Toledo from Roman times, the Moors and the Reconquest by the Christians during the 15 century which she described brilliantly, sympathetically and empathetically. Perhaps the best guide I have ever encountered on our various trips throughout Spain. We had previously booked lunch at a typical small restaurant Virgen de la Estrella. Here we were served Sopa Castellana followed by expertly cooked Venao en Salsa, (look them up) both typical dishes of Castilla-la Mancha. Our dessert was also a new one on us being a local Easter pudding to put on some calories after the fasting of Lent. Torrijas, as they are called, were thoroughly enjoyed by everyone. Thoroughly replete we made our way back to the coach and our return journey to Madrid. Not sure how many made it out in the evening, some went to theatres and others to bed early after reminiscing over a drink in the lounge. It was a long morning walking around the narrow streets of the city with a visit to a sword making workshop and silversmith for which Toledo is famous, the many historic buildings including the Church of Santo Tomás where we were able to view the world famous painting by El Greco “El Entierro del Señor Orgaz” , the Synagogue and the indescribably beautiful Cathedral, all expertly described in detail by Carmen. At 9.00 am we were met at the hotel by our guide for the day, Jose Manuel, for our day excursion to the monastery/palace of San Lorenzo del El Escorial. This is a UNESCO World Heritage Site and one of the most visited sites in Spain. Once again we were blown away by the huge knowledge Jose imparted, (equally as good as Carmen) and a delight to listen to, Jose gave so much information about Madrid and surrounding area on our 45 minute journey to El Escorial. He also proved an absolute expert on the Palace and Monastery and with so much information that he imparted very enthusiastically. 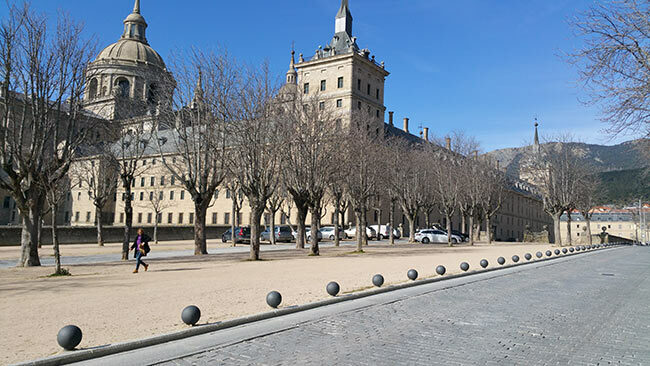 El Escorial was conceived by King Philip 11 as a burial place for his father Charles V, (the Holy Roman Emperor), and as a monastery and a palace. 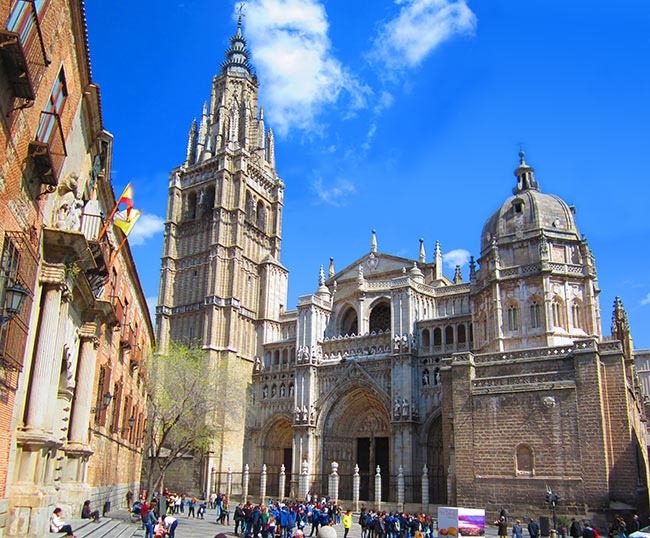 Construction started in 1563 and was finished in 1584 It is a masterpiece of Spanish Renaissance architecture. 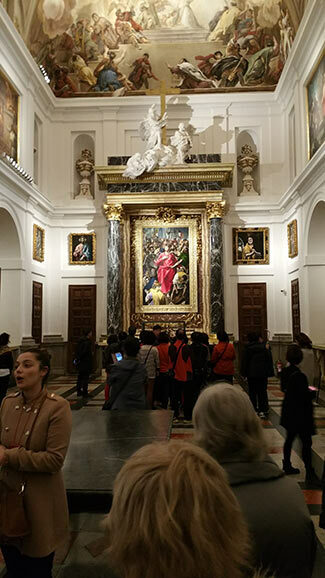 With its beautifully preserved frescoes by renowned Italian and Spanish artists, paintings and sculptures and many other treasures within the complex security was very high. The library with its huge collection of rare books is amazing. Our pre booked lunch was at the Asador del Rey just overlooking the Monastery. Unanimously agreed, that without doubt, this was the best meal of the holiday. Great food in a beautiful setting, highly professionally served and must not be missed if ever you are visiting El Escorial The owner is a big aficionado of Menorca , holidaying in Sant Lluis every August. After this very leisurely lunch we re-boarded the coach for the short 8 kilometre journey to the amazing but also rather upsetting Valle de Los Caidos, (the Valley of the Fallen). Sited on the Sierra de Guadarama hills about 3000ft above sea level this monument was conceived by the Dictator Franco as a memorial to those who lost their lives during the Spanish Civil War. The underground basilica is larger than that of St Peters in Rome and the long vaulted crypt was excavated through the solid granite within the mountain to the massive transept which is directly below the 152 metre high cross which stands on top. This is clearly visible from over 20 miles away. Work started in 1940 on the construction of the monument and took almost 19 years to build with a constant 3000 workers most of whom were Republican Prisoners of War being replaced as they became infirm, injured or died. Controversially, upon his death in 1975, it was decreed by the government that Franco be buried next to the altar although he and his family wished him to be buried in Madrid. Our journey back to Madrid was lightened from our sad reflexion of this site by Jose giving more valuable information of more places “not to miss” whilst in Madrid. Our last day As our return flight to Mahón was in the evening we had a full free day to catch up on those places still not visited or to revisit others as we wished. At 5.00pm our coach picked us up at the hotel for our transfer to Barajas airport and our 8.30 pm flight. Although 30 mins late in leaving the pilot had the “pedal to the metal” and the journey only took an hour. Staying overnight at the Port Mahón Hotel he and his crew didn´t want to miss dinner. we think!! A fantastic 5 days with much humour, companionship and lasting memories expertly arranged by Gundi Graf of Viajes Sant Lluis. Who is already following up on our idea for the next trip, possibly to Granada for the Alhambra with side tours perhaps to Cordoba, Guadix and the Alpuharras. Thinking of 21st November the quotations from the airline and hotel are very favourable compared to Madrid and provisional reservations are already made which will be held until 60 days prior to departure. Details will be supplied in due course. Thanks to you all who joined the trip. Las mejores vistas de la capital, fabulosos museos, espadas, orfebres, cristianismo y judaísmo, palacios, monasterios, comida típica castellana y un montón de tapas. Nuestro itinerario ideal se convirtió en realidad con la ayuda de Gundi de Viajes San Luis y cumplió en estos 5 días con las más altas expectativas de todos y cada uno. El primer día: Amaneció con todo el grupo en el aeropuerto a las 6 de la mañana. Sí, las 6 de la madrugada, para coger el vuelo directo de primera hora a Barajas, con Air Nostrum, a las 7. Pudimos disfrutar del lujo de tener los asientos ya reservados, todos juntos y además en la parte delantera del avión, (en el vuelo de vuelta lo mismo). El avión salió puntualísimo y a las 8 y media nos subimos a nuestro bus contratado especialmente para el traslado al hotel, al que llegamos a las 9 en punto. Nuestro grupo se completó con las 2 parejas que llegaron por la tarde volando directamente desde Inglaterra. El hotel Best Western Los Condes de 3 estrellas no podía estar mejor situado para explorar Madrid. A 50 metros de la Gran Vía, en el mismísimo centro de la ciudad, un hotel pequeño, limpio y confortable, con un personal muy amable. Teníamos contratado alojamiento y desayuno. Tan temprano no esperábamos tener las habitaciones listas, pero nos dieron una para depositar el equipaje y poder refrescarnos. Aún teníamos todo el día y la noche para explorar los sitios que cada uno había escogido, así que todos se dispersaron rápidamente para llegar a los lugares que tenían pensados, entre el Prado, el Museo Reina Sofía, el Palacio Real, el Retiro, las tiendas de la zona de Gran Vía (para sólo nombrar unos cuantos). Por la tarde, cuando pudimos ocupar todas las habitaciones, todo el mundo necesitaba una pequeña siesta, para luego salir de nuevo a tapear o a cenar, cosa fácil ya que estábamos rodeados por multitud de lugares donde escoger... La Puerta del Sol, la Plaza Mayor, la Puerta de Alcalá y una gran cantidad de teatros y locales estaban a un paso del hotel. El segundo día: Después de un sustancioso desayuno continental llegó nuestro autocar, como acordado, a las 8 y media, y Bryce nos acompañó en nuestro viaje de 50 minutos hasta Toledo, Castilla-La Mancha. La ciudad está situada encima de una pronunciada curva del profundo lecho del río Tajo, arriba en lo alto de las rocas que son su defensa natural. Allí nos esperaba Carmen Gómez, nuestra guía para este día en Toledo. No habríamos podido encontrar mejor guía que esta joven mujer doctorada en Filología hebrea y religiosa por la Complutense de Madrid. Muy abierta y cariñosa, Carmen fue una inagotable fuente de información sobre la historia de Toledo, desde los tiempos de los romanos, la ocupación árabe y la reconquista por parte de los cristianos durante el siglo XV. Todo explicado de manera brillante, simpática y empática. Probablemente es la mejor guía que he conocido nunca en todos nuestros viajes por toda España. Un largo paseo por los estrechos callejones de la ciudad nos llevó a un taller de fabricación de espadas y orfebrería, productos estrella de Toledo, por muchos edificios históricos, como la iglesia de Santo Tomás, donde pudimos ver el famoso cuadro de El Greco “El Entierro del Señor de Orgaz”, como la sinagoga y la increíblemente bella Catedral, todo comentado y explicado con fundamento y detalle por Carmen. Teníamos el almuerzo programado en un pequeño restaurante típico de la ciudad, Virgen de la Estrella. Nos sirvieron Sopa Castellana y como segundo un Venado en Salsa muy bien preparado, ambos platos típicos de Castilla-la Mancha. El postre era igualmente nuevo para nosotros, Torrijas, un glorioso punto final para este menú, que disfrutamos todos. Con el estómago llenísimo volvimos al autocar y a Madrid. Dudo que muchos salieran esta noche, algunos sí fueron al teatro, pero muchos directamente a la cama, después de repasar el día con una copa en el bar del hotel. Fue un día libre para que todos se pudieran mover a su antojo. Por la noche en el hotel intercambiamos, cansados y felices, nuestras aventuras. A las 9 de la mañana, Jose Manuel, nuestro guía para este día, nos recogió en el hotel. El destino fue el monasterio/palacio San Lorenzo de El Escorial, Patrimonio Mundial de la UNESCO y uno de los monumentos más visitados de España. De nuevo nos dejó boquiabiertos el inmenso conocimiento de José (tan buen guía como Carmen). Fue un verdadero placer escucharle, en los 45 minutos de carretera hacia el Escorial ya nos dio muchísima información sobre Madrid y alrededores, y luego resultó ser un auténtico experto en el palacio y monasterio, entusiasta en sus explicaciones. El Escorial fue ideado por Felipe II como sepulcro para su padre Carlos V, Emperador del Sacro Imperio Romano Germánico, como palacio y monasterio. Su construcción comenzó en 1563 y terminó en 1584. Es una obra maestra de la arquitectura renacentista española. Con los bellos y bien conservados frescos de famosos artistas españoles e italianos, sus cuadros, esculturas y muchos otros tesoros, las medidas de seguridad fueron muy severas. La biblioteca con su inmensa colección de libros raros es impresionante. Nuestro almuerzo nos esperaba en el “Asador del Rey”, así lo habíamos reservado desde Menorca, con vistas sobre el monasterio. Todos estamos de acuerdo en que fue sin duda ninguna la mejor comida del viaje. Una excelente preparación, un lugar hermoso, un servicio muy profesional. Cualquier visitante de El Escorial debería probarlo. El propietario es un gran amante de Menorca, y veranea cada agosto en San Luis. Después de este extraordinario almuerzo volvimos a subirnos al autocar para recorrer los 8 kilómetros que nos separaban del impresionante y desconcertante Valle de los Caídos. 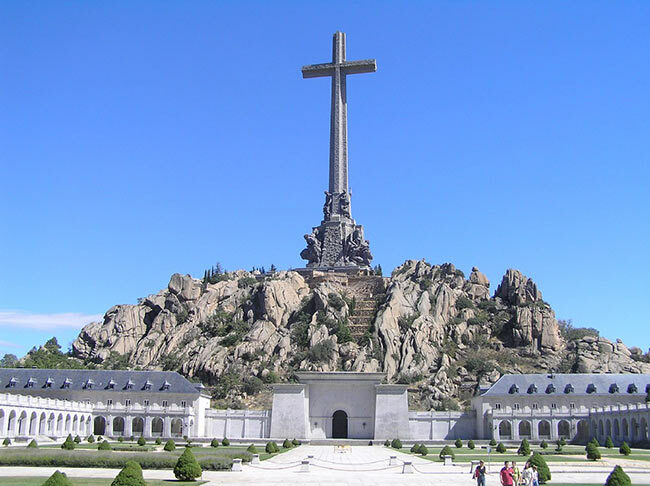 Se encuentra a unos 1000 metros encima del nivel del mar, en la Sierra de Guadarrama, y fue ideado por el dictador Franco como monumento para los que perdieron la vida en la Guerra Civil Española. La basílica subterránea es más grande que la de San Pedro en Roma y su larga y abovedada cripta se escavó en el sólido granito de la montaña hasta el crucero que se encuentra exactamente debajo de la cruz de 152 metros de altura que adorna la construcción, y que se distingue desde una distancia de hasta 20 kilómetros. Las obras comenzaron en 1940 y fueron necesarios hasta 19 años y un número constante de 3.000 trabajadores para terminarlas, mayoritariamente se trataba de prisioneros de guerra del bando Republicano, que se sustituían al ritmo que enfermaban, quedaban heridos o morían. A la muerte de Franco en 1975, con mucha polémica el gobierno decretó su entierro aquí, cerca del altar, aunque su familia había deseado un funeral en Madrid. Nuestras tristes reflexiones sobre este lugar se dispersaron cuando, durante nuestra vuelta a la capital, José nos volvió a dar más información sobre lugares que no te puedes perder en Madrid. El quinto día, Nuestro último día. Como nuestro vuelo de vuelta no salía hasta la tarde, teníamos aún un día entero a nuestra disposición, para visitar estos sitios que aún no habíamos visto o para repetir un lugar ya visitado. las 5 de la tarde nos recogió el bus del hotel para trasladarnos a Barajas. Teníamos que salir a las 8 y media, y el piloto recuperó nuestro retraso inicial de unos 30 minutos pisando a fondo el acelerador, así que sólo tardamos una hora para llegar a Menorca. Supusimos que la razón era que la tripulación no se quiso perder la cena en el Port Mahón! 5 días fantásticos, con muchas risas, mucho compañerismo y recuerdos imborrables, preparados con mucha profesionalidad por Gundi Graff de Viajes Sant Lluis. Que de hecho está ya sondeando las primeras posibilidades para un nuevo viaje, probablemente a Granada., con visitas a la Alhambra, Guadix y las Alpujarras. Estamos enfocando fecha de salida del 21 de Noviembre, ya que los presupuestos de vuelos y hotel son muy favorables, y las condiciones nos permiten una opción a reserva hasta 60 días antes de la salida. Más detalles en cuanto avance la preparación. Muchas gracias a todos los participantes del viaje.